Reglin Rubber Load Mats are an ideal solution for safe load restraint. By increasing the coefficient of friction between vehicles and cargo, rubber load mats reduce the risk of dangerous slipping of loads during transport. The quick and easily installed anti-slip Reglin Rubber Load Mats create a non-slip surface wherever they are used, and can be supplied in a wide range of versatile custom made strip and sheet sizes. Reglin Rubber Load Mats conform to the requirements of the National Transport Commissions Load Restraint Guide. The transportation of cargo by road, rail, sea or air can be a dangerous practice with large and varying loads being shipped long distances every day. When a load settles, the lashings loosen and cause a huge reduction in tension and a potential hazard. With hundreds of Australians injured or killed each year due to unrestrained loads, safe load restraint has become a critical issue for the transport industry. an additional 20% of its weight vertically. Some industry practices have been tested and the forward restraint found to be only half that is required. There is often a greater chance of losing a load when braking at low speed, than at high speed as it is easier for the brakes to grab at low speed and cause the load to shift. The types of load restraint equipment used in the transport industry are ropes, webbing strap, turnbuckles, short chains etc. These restraints might feel like the load is properly secured but the actual tension is low and is mostly ineffective for restraining loads particularly whilst in transit. 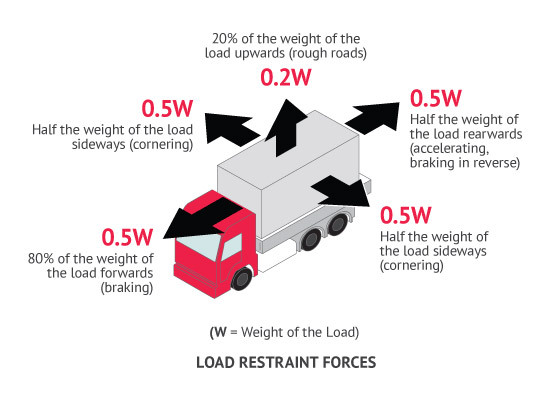 Generally: The weight of the load alone cannot provide enough friction to restrain it during normal driving. Additional restraints or load mats should be used. There are many regulated global standards, relating to these practises, with Australia following suit with its National Transport Commission’s NTC Load Restraint Guide (LRG) for Heavy Vehicles. The NTC Load Restraint Guide provides transport drivers, operators, and other participants in the transport chain of responsibility and logistics with the basic safety principles that need to be adhered to for the safe carriage of loads on road vehicles. Rubber Load Mats are used throughout the transport industry for non-slip protection, to increase friction between vehicle and cargo surfaces. They can be used for all kinds of general and specialist cargo on trucks trains, ships or planes. High Friction: Rubber Load Mats utilised as an anti-slip device, are ideally suited for this task. This is due to their high frictional properties combined with compressibility under load, which creates great slip resistance and reduces the number and force of the lashings required to secure loads. This in turn significantly decreases the dangerous risk of loads shifting during transportation and dramatically reduces safety issues for both drivers and other road users. The Best Practise: The most cost-effective method to tie down many loads is to put tough rubber load mats underneath and between the load. Rubber Load Mats can more than halve the number of lashings required. Reglin Rubber supply a range of durable Rubber Load Mats made with natural rubber to suit the diverse requirements of the transport industry. These products are all designed, to be used as a non-slip mat under and between loads to increase friction and can be supplied in range of densities, sizes and strengths depending on service requirements. Webbing straps with the addition of interlaying Rubber Load Mats can be used instead of chains for restraining smooth steel. It is common knowledge that the use of Rubber Load Mats underneath and interlaying a load can more than halve the number of lashings needed. This offers drivers, owners, operators, freight consignors, manufacturers and suppliers, peace of mind and significant cost savings as the time needed to secure the load is much less and there is a much higher chance of load arriving at its destination safely. 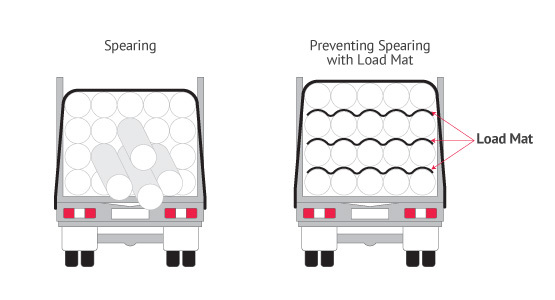 The use of Rubber Load Mats can greatly reduce the number of tie-down lashings required especially for loads with slippery surfaces (see Figure 1a). 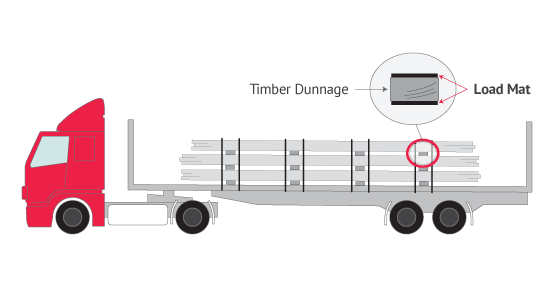 Packs of hollow sections can be restrained using timber dunnage with Rubber Load Mat bonded to the top and bottom of the surfaces so spearing of the hollow section from within the pack is prevented (see Figure 1b). All Reglin Rubber Load Mats are designed for high friction and have been independently tested to ASTM D1894-11 with modification to a flat steel surface (for static and kinetic coefficients of friction). It exceeds a coefficient of friction of 0.6 between the load mat and steel in both wet and dry conditions as set out by the National Transport Commission (NTC) Load Restraint Guide (LRG). 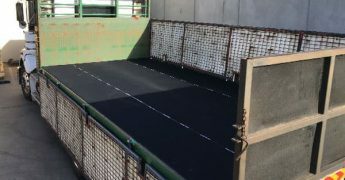 Reglin Rubber Load Mats can be supplied in rolls, custom cut strips and pads to ensure easy installation and to suit the particular requirements of the cargo being transported. For more information on our range of Rubber Load Mats, please follow the links to the Load Mat Product Directory of the website. To request to view Friction Coefficient Certificates here.